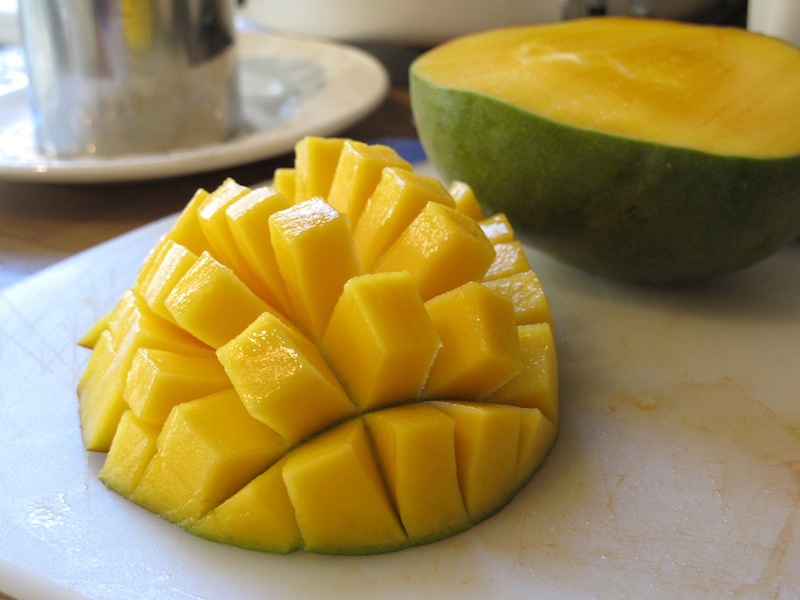 There was a fat juicy mango sitting in the fridge for the past days, waiting to be eaten. I was just going to criss-cross cut each half, push the cubes out by flipping the skin inside out and devour the juicy sweet meaty flesh, cube by cube off the skin when I sit home and relax, not think about anything but chill on a Friday night. Instead of just simply enjoying my beloved fruit on its own, she was very carefully prepared to be married with smoked salmon. 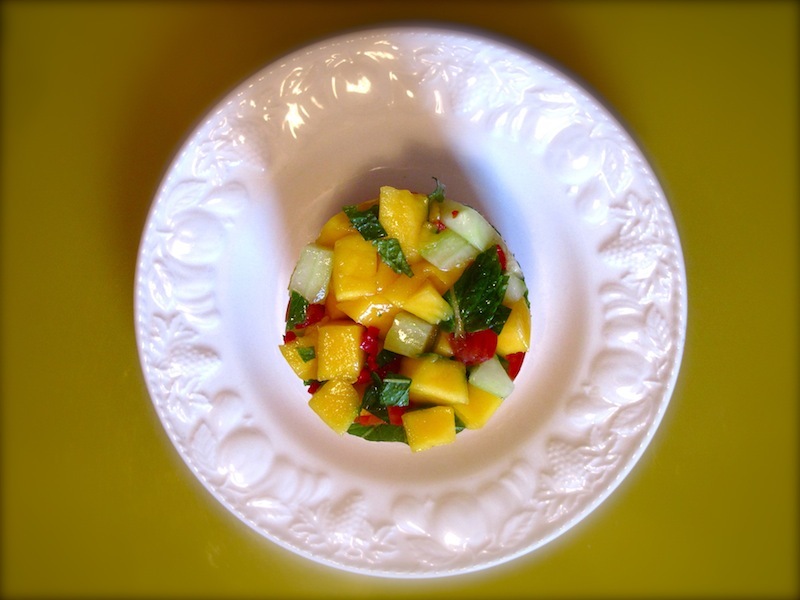 I came across the 'scallop with gingered mango-tomato salsa' post on DorieGreenspan’s blog and thought I could spread this idea over to salmon. 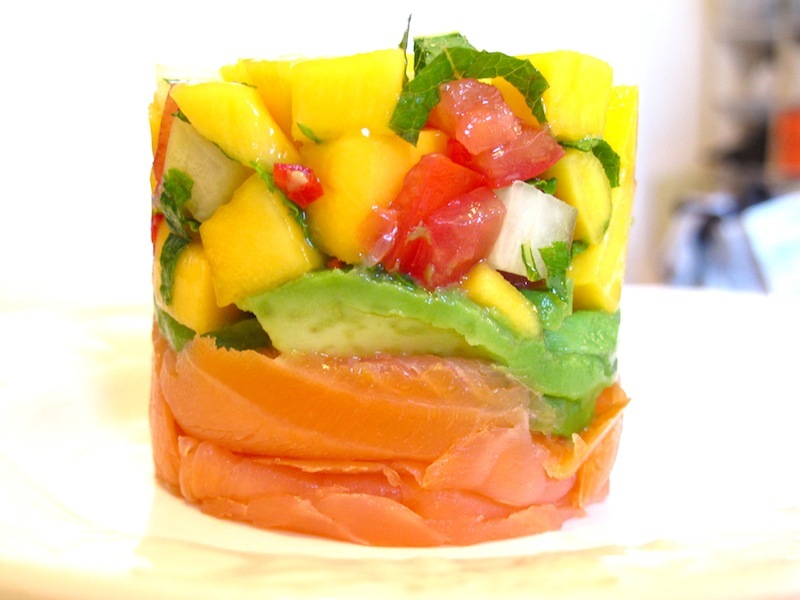 When I surfed further, I found Health Burst’s site on Salmon stack and thought it looks stunning and delicious. So I made my version of salmon stack and initiate my attempt to carefully stack the ingredients in the food ring. It looks really impressive. And it looks like it came straight out of a restaurant kitchen! So easy and no cooking involved! Brilliantly simple. 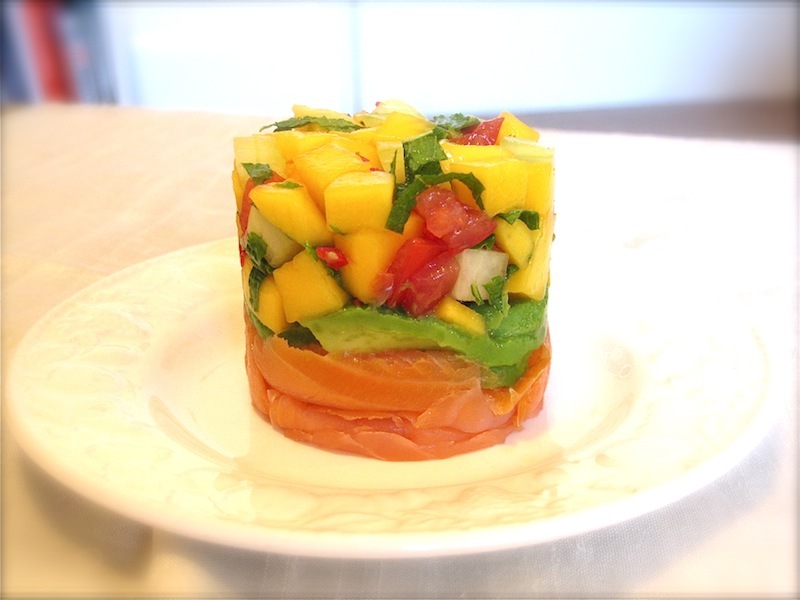 My similar version of Healthy Burst's Salmon stack. 1. Prepare the lime chilli mayonnaise first. 2. Stir the mayonnaise with juice of half a lime and finely chopped chilli. Put aside for later. 3. 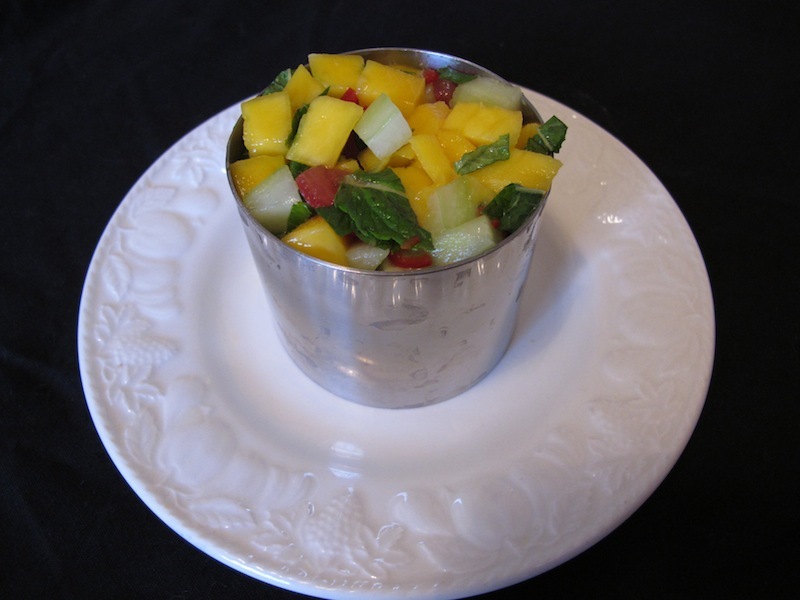 Prepare the mango salsa by mixing the ingredients together. Sprinkle some salt and pepper to taste. 4. Place a the cylindrical food ring on the plate you are serving with. 5. 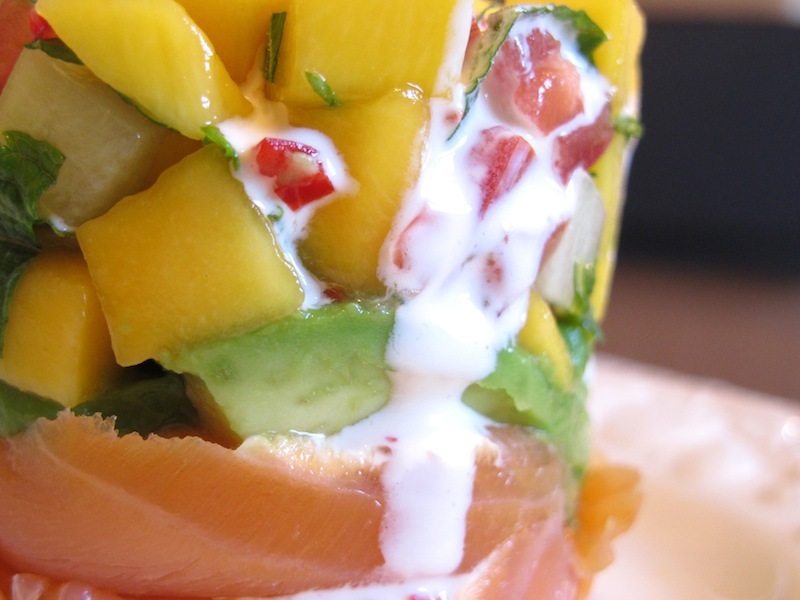 Layer it with the salmon then avocado. Push them down slightly to make sure they are compact. 6.00Top it up with the mango salsa and make sure they are well packed so they keep in shape and will not fall off when the ring is lifted out. 7. 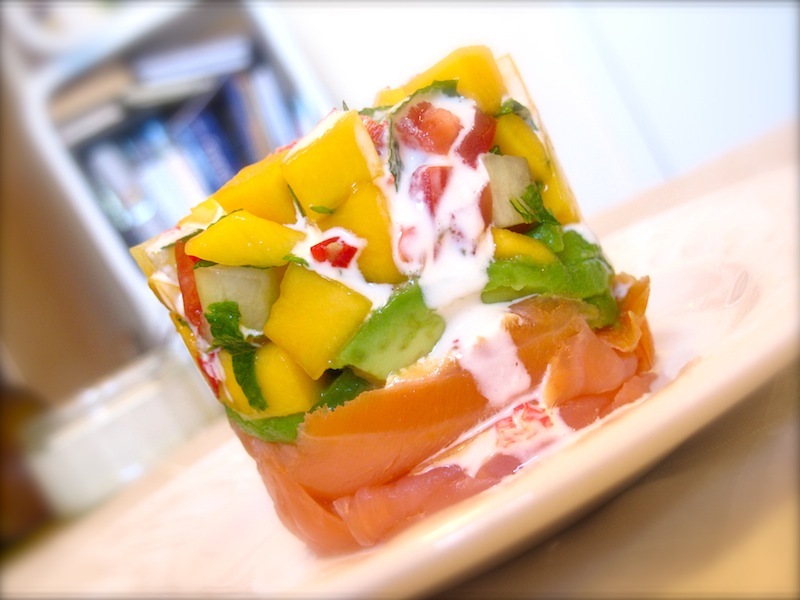 Lift the ring when ready to serve and spoon some of the mayonnaise mix on to the salmon stack. I would try make the mayonnaise with a pinch of chilli powder or curry powder the next time. This look yum! I can't wait to try it!